» home » magazine » 2009 » august 2009 » do you have what it takes to move into the medical market? 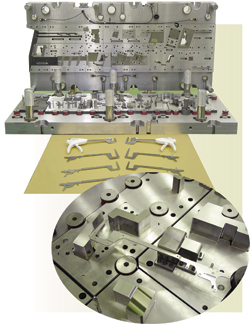 This progressive die (with strippers removed for clarity) was developed by Oberg Industries and runs at its plant in Sarver, PA, to produce five different sizes (four shown here, above) of frame stampings for a Covidien TA DST Series open surgical stapler. Oberg developed two dies for the stapler, one to make right-hand frames and the second to make left-hand frames. Each die comprises 19 stations and runs at 70 strokes/min. in a 300-ton Minster E2-300 Hevi-Stamper mechanical press. Material is fed through a Herr-Voss precision leveler to help maintain part-flatness tolerances of ±0.002 in./1.000 in. Also critical is true hole position, to ±0.002 in. ; maximum burr height is 0.002 in. Shown in the close-up photo is the punch shoe, with stripper removed. An aging population that expects increased quality of life through more and better treatment options continues to feed the healthy and rapidly growing medical-device and supply industry. U.S. manufacturing companies supplying this market with monitors, drug-delivery systems, therapeutic devices, surgical instruments and appliances, and other products have catapulted the country to a position of global leadership. In some areas, that leadership position astonishes—for example, the United States accounts for 60 percent of the world’s market for minimally invasive medical devices, according to a recent survey from Themedical (http://www.themedica.com). Overall, the survey finds, the global market for medical devices (including instruments) is forecast to yield $201.6 billion in 2010, with several segments forecast to grow at an annual rate of 7 to 10 percent or more over the next several years. Trends governing the growth of this lucrative industry? There are more doctors and dentists than ever before. And, more and more patients expect portability from their devices, to deliver care at the bedside or even a from home. Examples (offered up by Phil Salditt, director of customer development for Plexus Corp., a manufacturer of printed circuit boards for the medical-device and other industries, in his paper titled, Trends in Medical Device Design and Manufacturing) include products for cardiac pacing, pain management, drug delivery, and blood-chemistry monitoring. All of these new products require a fresh approach to design and functionality, including ruggedness, wireless connectivity and a user-friendly control interface. And, manufacturing volumes, particularly for disposable medical products, have risen exponentially in some cases, forcing manufacturers and suppliers to add automation to their production and assembly lines. Critical to tier manufacturers along the medical-industry supply chain is diligent attention to quality, governed up and down the supply chain by ISO 13485—Medical Devices—Quality management systems—Requirements for regulatory purposes. While still not widespread, more and more suppliers have recently begun to work toward becoming certified to this standard, which underwent a significant upgrade in 2003. The Weiss-Aug pressroom features Bruderer high-speed presses from 20 to 90 tons. The firm’s expansion in the medical arena has focused on developing strategic customers—those that would generate at least $1 million in annual sales. Weiss-Aug specializes in new-program development, assisting OEMs early in the design stage of products such as the surgical disposables shown here, to ensure quality and manufacturability and at the same time help control costs and prevent overruns. Frank Nisco, director of global sourcing for medical-device manufacturer Covidien, tells MetalForming that, “I can’t emphasize quality enough, and nothing else comes close as being so important when we rate our suppliers. Quality accounts for 50 percent of our supplier scorecard (with price and on-time delivery performance each accounting for 25 percent). And while today we expect ISO 9001 registration at a minimum from our suppliers, we are moving quickly toward expecting all of our suppliers to also comply with ISO 13485.” All of the firm’s stamping suppliers also have TS 16949 registration. Covidien, based in Dublin, Ireland, maintains U.S. headquarters in Mansfield, MA, and has product lines in medical devices, imaging solutions, pharmaceutical products and medical supplies. A recent survey from Crimson Life Sciences finds that, from the standpoint of risk management, the device manufacturer and its contracted suppliers are considered one and the same, so suppliers must be held to the same standards as the OEM. More than one third of the total supplier base to the medical-device industry has ISO 13485 certification, according to the survey (and more than 50 percent when looking at nonexempt suppliers, or those suppliers of components such as springs and other metalformed parts that are not exempt from destructive and incoming inspection). Covidien’s Nisco says that to help its supply base improve and more consistently achieve its required minimum CpK of 1.33, the firm has increased its focus on supplier training, in areas such as six sigma and lean initiatives. Among the attendees at the Covidien training program was Allen Nadeau, supervisor of shipping, receiving and finishing from metalforming company Southington Tool & Manufacturing Corp., Southington, CT. The firm produces stampings, springs and wireforms from presses with capacity to 100 tons, as well as from fourslide stamping equipment and CNC wireforming equipment. Among the medical products it supplies are ligating clips, medulary pins, surgical staples and sutures, and stents. Southington Tool & Manufacturing’s successful migration into the medical-product industry exemplifies that of numerous metalforming companies. The common thread weaving the successful formula for most: The development of the engineering and design know-how to help medical-product OEMs such as Covidien develop those perfect partnerships, where designs are turned into reality by creative process-development engineers. Case in point: Weiss-Aug Co., Inc., East Hanover, NJ, which manufactures surgical and drug-delivery devices. The firm specializes in new-program development, assisting OEMs early in the design stage to ensure quality and manufacturability and at the same time help control costs and prevent overruns. Weiss-Aug is a high-speed stamper and injection molder, with Bruderer presses from 20 to 90 tons. Born in 1972, the firm was raised on supplying primarily the telecommunications and automotive industries, until it retrenched itself in the medical marketplace about five years ago. Sheetmetal blanks processed on Pedigo's laser-cutting machine (a Trumpf TruLaser 2030 machine with a 2-kW laser and automated sheet loader and unloader, (left) are formed in a new Trumpf TruBend 5085 CNC press brake (above). the press brake's six-axis programmable backgauge and profiled fingers allow solid, repeatable gauging for odd-shaped parts and allows the operator to set up a series of bend stations along the bend of the brake. That said, Voitik and the plant’s sheetmetal supervisor Raul Zuniga agree that more and more of its customers desire the development and manufacture of custom products, in order sizes down to just a few. “Hospitals and doctors each have their own unique specifications for the sizes of the products they order from us,” says Zuniga. As an example, he cites the firm’s case carts, designed to hold a set of surgical instruments. The cleaning systems employed to sterilize the instruments can vary in size, and therefore Pedigo customers prefer the carts be custom sized to fit the capabilities of the wash systems. Annually, Pedigo processes 1.1 million pounds of stainless-steel sheetmetal from 20 to 12 gauge, and another million pounds per year of plate and tubing. Its defining quality characteristic to customers is surface quality. “We cannot tolerate even the tiniest of scratches or other surface defects,” says Voitik. 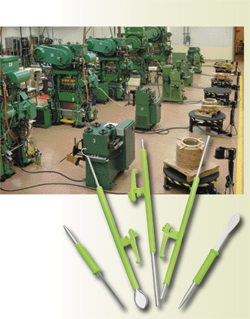 And although Pedigo employs press-brake tools lined with an 0.015-in. layer of protective urethane, its manufacturing department does not use a vinyl protective layer on sheetmetal blanks processed in its laser-cutting machine (a Trumpf TruLaser 2030 machine with a 2-kW laser and automated sheet loader and unloader). 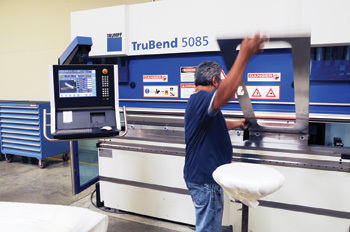 Along with its new laser-cutting machine, added in October 2008, Pedigo’s sheetmetal shop also added a Trumpf TruBend 5085 CNC press brake, and Trumpf’s TruTops programming system that integrates with Pedigo’s 3-D modeling software to automate press-brake as well as laser programming. Weiss-Aug’s approach for expansion in the medical arena focused on developing strategic customers—those that would generate at least $1 million in annual sales, says Weissenrieder. He finds that relationships between suppliers and customers are strong in the medical industry, dovetailing with the belief of Covidien’s Nisco that his firm’s suppliers are an extension of their company. “Our medical customers appreciate our manufacturing expertise,” Weissenrieder says, “which allows them to focus resources on new-product development, their real opportunity to gain a critical competitive advantage in a very competitive environment. Then, our engineering and manufacturing expertise focuses not only on honing a process to ensure quality, but also on s to minimize costs, obviously a hot topic in the healthcare industry today. We do this by developing complex stamping dies that allow us to combine several parts into one, or to perform multiple operations in the die and eliminate secondary operations and the associated added part-handling operations. The firm employs eight design engineers, up from three just a few years ago. Cost-control requirements have medical-device suppliers focused on automation, and Weiss-Aug fits the bill. The firm has invested plenty to automate its assembly as well as its inspection functions, since many of the parts it manufactures require 100 percent inspection. And, its newest stamping presses, including a 60-ton Bruderer acquired last year, are long-bed (to 30 in.) models that, says Weissenrieder, “allow us to design and run more complex and longer dies. Our dies have as many as 30 to 35 stations, so that we can perform more functions in the die, such as in-die assembly. We have eight of these long-bed high-speed presses now, which allow us to eliminate secondary operations, driven by the medical industry’s need for cost reduction. It’s the best strategy for us to compete with low-cost countries. “We also can no longer afford to sort parts,” continues Weissenrieder. “So, our processes need to be robust, ensuring zero defective parts shipped to the customer. This requires a robust design and robust tooling, with a manufacturing workforce that can run and troubleshoot our increasingly complex tools.” Weiss-Aug added 60 employees to its ranks within the last 2.5 years, and received a training grant from the state of New Jersey last years to help its expanding workforce meet the needs of its customers. Can automotive suppliers get in the game? Nisco thinks there could be opportunities.